Volvo Ocean Race, Jules Verne Trophy or Whitbread Round the World – melodious names in the world of pro-sailing, as well as the all-famous America´s Cup or the MiniTransat (of which I do have interviewed Skipper Lizzy Foreman on her 2015 Regatta) or the RACE. Big, wellknown names and established brands. But there is another exciting Regatta taking place right here on my doorsteps in my home-waters, the Baltic Sea: The Nord Stream Race. This is a regatta which is in in no way ranking behind the big worldwide regattas. First raced back in 2012 the Nord Stream Race is a relatively young regatta, nevertheless it´s as dramatic and unpredictable as any big regatta you can name. I am glad to have the chance to meet skipper Tim Kröger of SPIRIT OF EUROPE, who raced all of the four annual editions of the NSR and is the winner of Nord Stream Race 2015. Lars Reisberg | NO FRILLS SAILING.com: Tim, I am glad you found time to have a chat with me here in the marvelous newly styled rooms of the Norddeutsche Regatta-Verein Hamburg, the NRV. We do have a breathtaking view on the Alster here with Hamburg´s nightly skyline – good to have you here. Tim Kröger: I appreciate your invitation and, yes, welcome to the NRV, of which I am a club member since 20 years now. We do take pride indeed in our brand new club home. You are right: The view is just awesome. NFS.com: Tim, you are one of the international players in the German pro-sailing scene, most of us known by your engagement in the South African America´s Cup-Team SHOSHOLOZA back in 2007 and two Whitbread Round the World Races. Please tell us more about your connection to the Nord Stream Race, your history with this regatta. Tim: Oh, that´s a long story indeed. To cut it short: I am sailing since I was a little child. I was lucky to being able making my passion for sailing become my profession. I do sail regattas since I was young, quickly went on to become a crewmember on Admiral´s Cup-sized yachts and went onto my first around the world regatta back in 1993 to 94. I am a full professional, owners or racing teams can hire me to join their crews or lead the crews as skipper, as it is the case with Nord Stream Race in our fine Swan 60-yacht SPIRIT OF EUROPE. Apart from active sailing I do work as coach, have had published my second book recently and do offer courses for skippers and crews in teaching them on decent boat handling and the finesse of sailing. 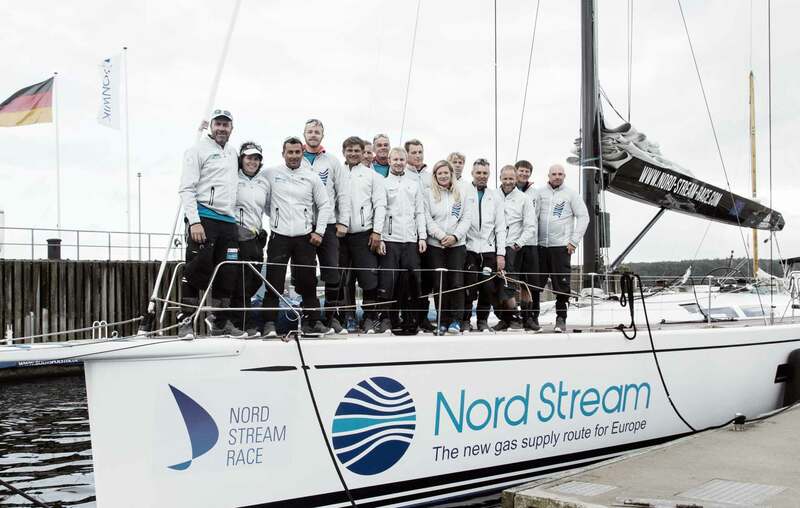 Considering the Nord Stream Race, as you may know, the Saint Petersburg Yacht-Club in collaboration with the Norddeutsche Regatta-Verein of Hamburg are the organizers of this Event, the Nord Stream pipeline company is the naming partner. The regatta is the longest race in the Baltic Sea to date and one of the most difficult. I am engaged in the NSR since its very first edition and have a very deep connection to that event. I really love the race indeed. NFS.com: What´s the character of the Nord Stream Race? Tim: As I mentioned, with some 800 miles it is the longest regatta here in the Baltic Sea. Taking place annually the race is carried out between the ports of Saint Petersburg in Russia and one of a German port like Flensburg – as it was in 2015 – or Warnemünde, as it is planned this year. The regatta will change direction every year, so last year we were racing easterly, with lots of backwinds, this year we will go the opposite direction from East to West which makes it a bit more complicated and exciting as well. The NSR pictures the Nord Stream gas-pipeline, delivering natural gas directly from Russia to Germany and thus Europe. That’s why I would call it an intercultural exchange as well. NFS.com: Which is why the boat of the Nord Stream-Team is christened SPIRIT OF EUROPE? Tim: Exactly. Bringing together Russia´s resources and Europe´s industrial and economical consumers directly through this offshore-pipeline is the main thing about Nord Stream itself. The name of our boat simply reflects this fact. Tim: … you name it. That is really one of the biggest challenges in terms of organization of the regatta. Racing from A to A, as you mentioned in bike racing, is from a logistical point of view the better choice. But with the NSR it´s more complicated: We do race from A to B and B is 800 miles away from A. So organizing the delivery back home after racing – or the other way round a relatively long delivery to the starting point – is for all participating teams a big factor making the NSR a special thing. It just takes a lot more time to plan and it´s surely a question of budget as well. Tim: You see, the race itself – depending on the weather conditions – takes place within 3 to 5 days in total. But you have to plan with a period of three to four weeks for the race preparation mainly and maybe for the delivery afterwards. And besides that, Nord Stream Race is starts this year at the end of May which is regatta high season. So for the participants, the partners, the teams and the crewmembers itself it´s the busiest time of the year. To structure the crew and get my core team to the start line will be the biggest challenge this year. NFS.com: You have been attending Nord Stream Race from the very first edition for the past 4 years now. Tim: And I am very glad having done so. 2012 when it was raced for the first time we were able to get second and that was exciting, very tough and nevertheless a very diverse regatta. It was good to see the race developing and gaining prestige and interest within the sailing community and in 2014 we´ve had 12 racing yachts competing. I am burning for my sport, it´s a passion that is way beyond the fact that I am a pro sailor earning my money with it. It´s not only a job. Everybody, who is part of my team is burning, driven by the passion to sail as fast as possible, to drive the boat at it´s very edge to be 100 per cent competitive and squeeze out the very last tenth of a knot. NFS.com: And the Nord Stream Race offers the opportunity to do so? Tim: Of course! 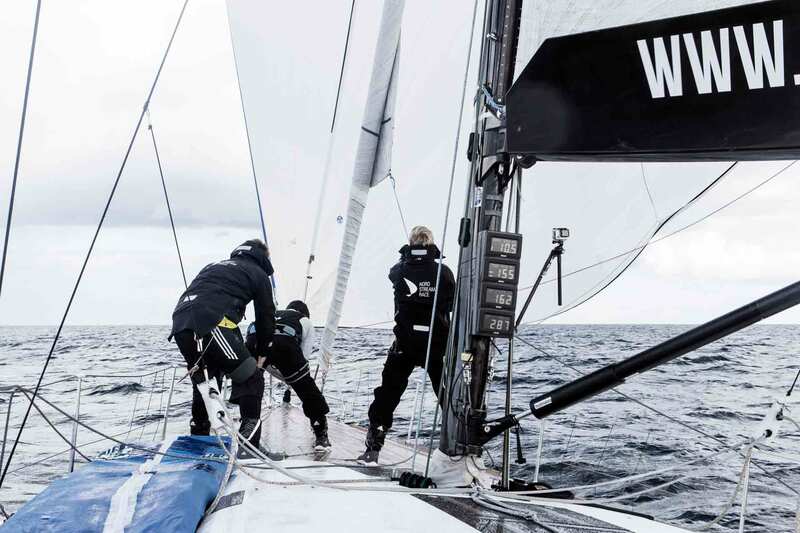 And more than that: Racing the Baltic Sea is unique and in many aspects are more exciting than an offshore race on the big wide open oceans: The Baltic Sea is a confined space, weather conditions can change rapidly and very greatly over the course of the race. Local phenomena define sudden variations and are demanding – all of the crew have to be on on there toes all of the time to react as quickly as possible. Then it´s a crowded stretch of water too: Fishermen, heavy commercial traffic and traffic separation schemes do restrict our racecourse to a sometime narrow corridor. 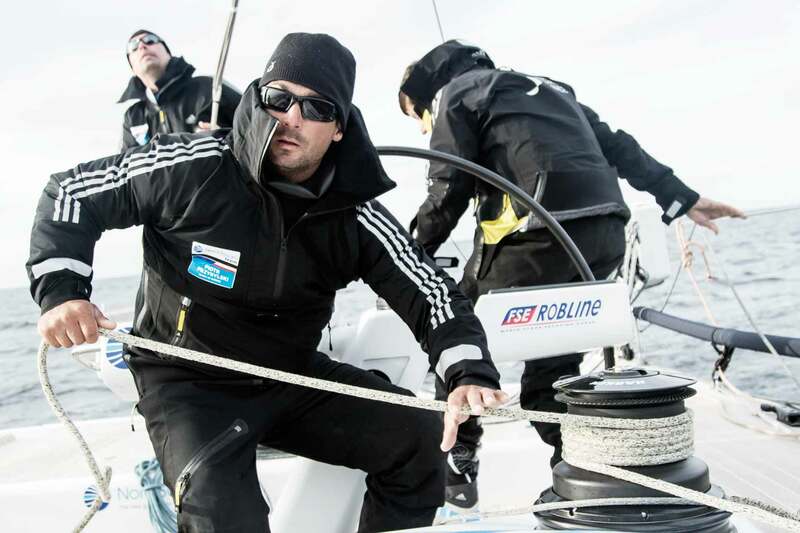 That is a unique feature of the Nord Stream Race calling for highly skilled crew. Tim: We do have a great team I must say. Everybody is focusing on his work, never losing the eye for the overall picture. Our crew is 13 people strong – amongst us there are 12 circumnavigations all in all, 11 America´s Cup participations and even one win in 2003. That´s what I would call a competent group of people – that enjoy racing with each other. NFS.com: In 2015 your boat SPRIT OF EUROPE crossed the finishing line as the first yacht of the fleet. Finally you have won the Nord Stream Race. What does it mean to you? Tim: Well, first of all it´s an overwhelming feeling of satisfaction. We as a crew can look back at the race and assert that we have done everything possible to gain the maximum. It´s just pure satisfaction. It´s the big things we have done right, made the right calls to get the best out of the weather conditions and – above all – we´ve been an ideal crew, open minded, fun-loving and strong when things get serious. NFS.com: What was the most driving force when underway in such a regatta? Tim: That´s very simple just one thing: Pushing the boat as hard as we can. You see, we are not recreational sailors when we are racing. We try to race the boat on a maximum level under all conditions while preserving the material to avoid breakage that will slow us down. The boat is precious to us, but we treat her in a way to squeeze out every tenth of a knot when possible. So that´s our mission: Go hard, go fast. NFS.com: How do you plan such a race in advance from a strategic standpoint? Tim: The Nord Stream Race is a unique race due to the fact that we are sailing in the Baltic Sea – a crowded place full of merchant traffic, restricted areas, fishing grounds and local weather phenomena which determine the whole trip. The strategy doesn´t change too much due to the fact that your runway, the race course, is not very wide. There are certain waypoints we have to pass, some traffic separation schemes to consider and the Finnish Gulf as well as Russian waters are pretty regularized. So that means there´s only a narrow corridor left in which we have to focus on maximum performance of the boat, planning ahead is required, but not so easy here. NFS.com: So no strategy at all? Tim: Definitely! The selection of the crew is the most crucial part, believe me. Winning or losing starts with choosing the right people. After three years I can say I do have the best crew imaginable, most of them are sailing with SPIRIT OF EUROPE for the fourth time so almost everyone knows each other, knows the course and the race and the style we want to treat the boat. You see, we are professional sailors – except some of the crew who have to be amateurs due to the class-rules, but they also have a very excessive racing background – but we still have fun with what we do. There´s a big misconception when it comes to people talking of pros. We are considered sturdy, emotionless and job-oriented but that is not the reality. Sure, we earn our money with what we do but that doesn´t mean we have no fun. It´s just a different interpretation of “fun”: Where other sailors define this by having a Mojito with a cocktail stirrer in the sunset we are driven by the passion of going as fast as possible and to be able to beat the competition. What looks like bitter-grave earnestness is more a focused seriousness but nevertheless a form of fun as well – when it suits. So, yeah, strategic planning in this case means choosing the right crew. NFS.com: And what about the tactics while underway? I suppose you monitor the weather, but do you observe your competition as well? 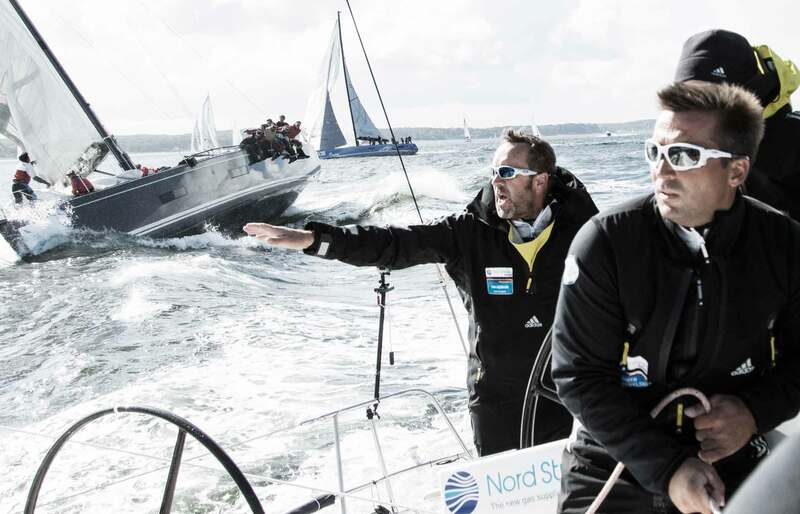 How are tactics being made when racing the Nord Stream Race? Tim: At first there is no support from a land-based weather router. That´s strictly forbidden in this race. Of course we do have real time trackers on board every yacht thus enabling us to see what the other teams are doing. 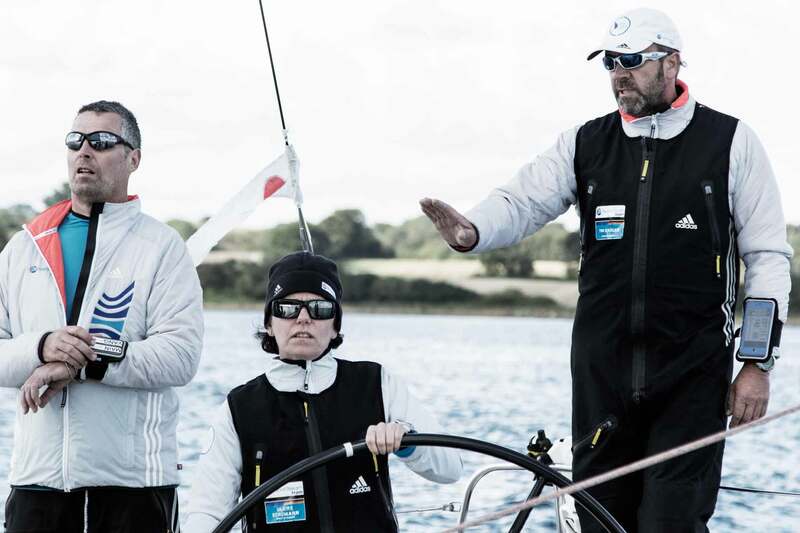 But that is not all: To position your boat where you may get the best possible winds and being able to keep an eye on your competition is the main issue here – like in every other regatta. Tactics are mainly proposed by the Navigator who, I would say, is among the most important crew members. 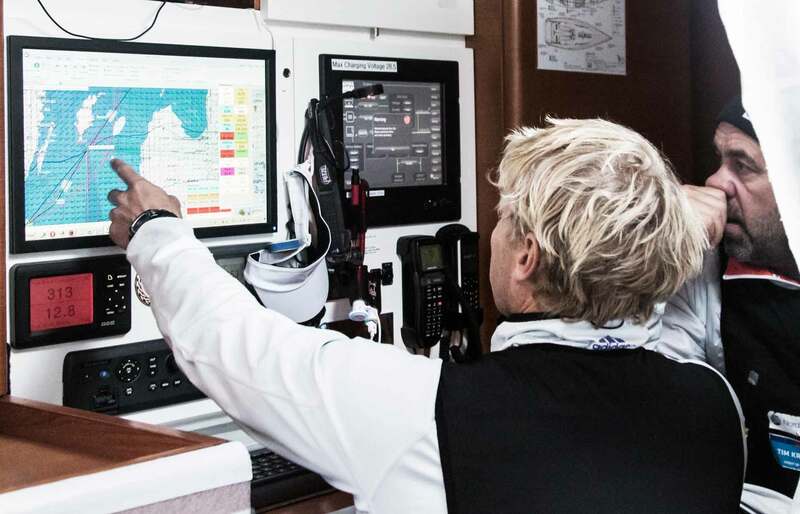 He is the one who can tap various sources for his analysis of the weather conditions and predictions where to sail next in order to get the best course for the best performance. The decisions are normally take by a kind of steering group of the most competent team members – for example the watch captains, the navigator and finally the skipper. NFS.com: What do you mean by “sources”? Tim: Well, a Navigator uses different sources to get his data from. Where a recreational sailor might look at a chart in the marina, browse to Windfinder.com to plan his next leg or a circumnavigator may get a Navtex occasionally, a race navigator has a great variety of sources, mainly through the internet. His knowledge and proposed decisions are based on sources or services that are unknown but anyhow accessible to a broader public. It´s his treasure making him a valuable person. The tricky part here is that you cannot predict local weather conditions perfectly such as the ones in the Baltic Sea. Racing in open waters like the Atlantic or the Pacific makes predictions sometimes easier. This is his art, he has his own set of sources and connections. NFS.com: So it´s mainly weather? Tim: Yes and no. Key to success is the scheme of the watches. On SPIRIT OF EUROPE we have a pretty proven system – also very unusual for most recreational sailors but common in professional racing. Of my 13 member crew, I do not want the watch to loose concentration over their time stretch. The problem with normal schemes is that the old watch is depleted towards the end of their watch and sometimes not willing or not able to invest the amount of high energy needed to drive the boat hard or perform a needed sailchange. So we do have a system of two big watches of three people each, with the watch captain, the bowman and one as we call it trimmer or driver, and two small watches with two or three people each, mainly one allrounder and a trimmer/driver. The system is to mix those watches every four hours and the outcome is that you always have fresh people on deck and it´s always a new mix of people, no routine here. With this system we had two guys that had their own rhythm – the navigator and the media crewmember who also prepared the food. NFS.com: That´s clever indeed. But you as the skipper are not on deck all the time? How do you maintain control of the crew and the decisions made in your absence? Tim: I was one of the two watch captains, within our system but without trust there´s no race-crew. I cannot be on deck all the time, so I share with the other watch-leader. But of course, when serious bigger decisions have to me made they do call me up, but the key factor is trust. Remember: Everyone is driven by the passion to ride as fast as we can. That´s the main thing. All of my crew are professionals in their own right and I do trust them for a hundred per cent. There is only one mission: Maintain continuity in racing and push the boat as fast as possible. NFS.com: The Nord Stream Race is divided into two classes, the Swan 60 and the ORC. Tell me more about the boat itself, her character and special features. Tim: Racing a regatta in a One Design Class is something special. The boats are identical. You can try to add something by using a different sailmaker for example but initially the boats are the same an check measured. A Swan 60 is a premium style Cruiser/Racer I would say. Very spacious and luxurious below deck. We do have electric winches and a hydraulic main sheet and many people consider that “uncool”, but I think there´s a chance to it: I can invest in people with brain, not primarily in muscles. You can race on this boat even when you are not super beefy – it helps of course, but is not primarily required. It’s an interesting subject and as I told you, the crew is always crucial. It gives new options in picking the people. These boats are pushed hard whilst racing, but always within their abilities. It´s a yacht race. A private owner would probably treat the Swan differently from how we do it but there is a mutual respect for the equipment we use – we always keep in mind, to finish first – first you have to finish. Setting an Spinnaker and taking it in in seconds. Tough work. NFS.com: So nothing special in terms of equipment except sails? NFS.com: This year you´ve won the Nord Stream Race with SPIRIT OF EUROPE. What was the hardest situation you and your crew had to go through in previous races? Tim: It was a calm in the 2013 edition. I can still see it right in front of my eyes very clear. What a hilarious situation: We were laying becalmed in a very small area under a cloud. We could see our opponents in a close distance. They were realizing that we were locked in a dead calm, so they altered their courses just a little bit to stay in the breeze and sailed first around and then past us – less than 200 meters away! It was shattering, like a stab in the heart. We couldn´t do anything about it – two hundred meters! But that´s yacht racing, isn´t it? Besides that we´ve had no dramas at all. We are all professional sailors and able seamen that grew up with yachting and to speak frankly, the risks of somebody stumbling over the side are of course never zero offshore, but rather slim. NFS.com: Vice versa, what was the most exciting moment of them all? Tim: To finish first in the last race of course! As I said, we are all driven by the passion to win races. And finishing with nearly one full hour ahead of the next boat was truly an exhilarating moment for the whole team. If you can finish your job with a clear win – that´s what counts most. 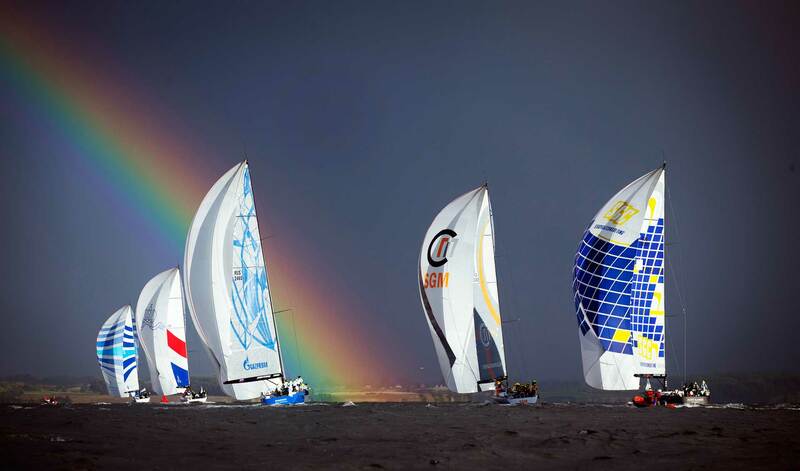 We are racing sailors and we keep racing till the end. It’s a task, nothing romantic about it. But nevertheless, emotions joy were very high at this special moment. NFS.com: Tim, the last question for today: What do you wish for the Nord Stream Race? And what are your next plans or projects? Tim: When it comes to the Nord Stream Race I hope this wonderful regatta can establish itself amongst the big names of offshore races, what is a hard task. It depends on the partners, the Swan 60-class and is especially based on the commitment of the Saint Petersburg Yachtclub which I hope will remain high because it´s a unique and challenging high profile race. It´s good to have such a regatta in the Baltic Sea. The brand Nord Stream Race should gain continuity and grow of course. NFS.com: You will be at the starting line with SPIRIT OF EUROPE as her skipper at the end of May this year for the fifth edition of the NSR, what other plans do you have? Tim: Well, it depends. I learnt to be very flexible and open-minded as things quickly change or newly pop up at the horizon in my world. I do have my skipper-training program and work as coach. People – crew and skippers – can hire me for example on their own yachts to be trained – what I would call – the “finesse in sailing”. Everybody can participate from my wide range of experience as professional yachtsman. But whatever comes along, I try to pick the exciting and challenging tasks. Why not another adventure like the one onboard Steve Fossett´s PlayStation years ago? Right now I am focused on the upcoming edition of the Nord Stream Race and that´s a load of work ahead. NFS.com: Tim, thanks so much for this interesting and exciting interview! I hope I can manage to be at the finish line in Warnemünde in a couple of weeks and we can have an onboard-interview right after SPIRIT OF EUROPE with her brave crew have docked – hopefully – the old and new winner of the Nord Stream Race. Besides, dear reader here is an interesting interview I´ve had the pleasure to do with Richard Jeske of Hamburg, the boss of my sailing school, on his view of what makes a good skipper. 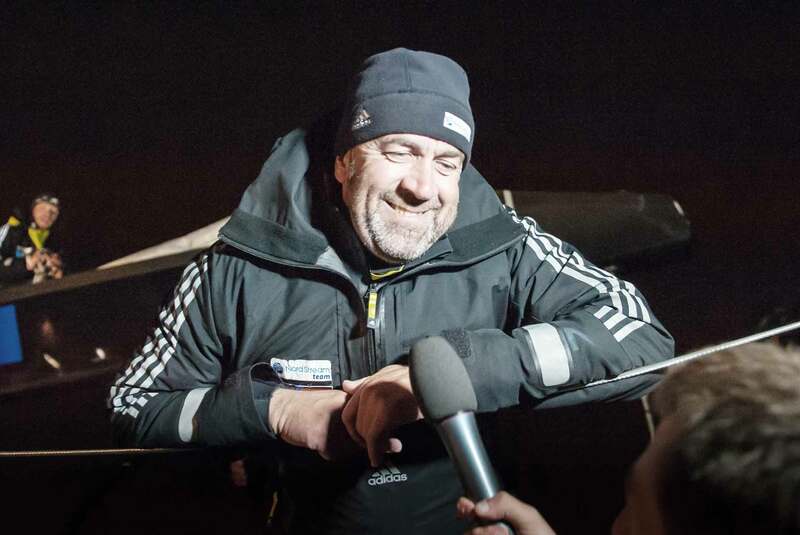 Tim Kröger has circumnavigated the world twice, in the Whitbread Round the World Race 93/94 onboard INTRUM JUSTITIA and in 97/98 onboard SWEDISH MATCH and was part of Steve Fossett´s crew on the trimaran PLAYSTATION during her fateful trip in The Race of 2000, he was Boat Captain of LE DEFÍ during the America’s Cup 2003 and of SHOSHOLOZA during the America´s Cup 2007. Tim has a unique track record of many yachtraces. Lately his second book “Ich bin wir” was published (unfortunately not in English – yet) and you may browse to his website to get more info on him. The fifth edition of the Nord Stream Race is scheduled to take place end of May/beginning of June, no official date announced yet.